Linda what a cute card. I really like that song too.... clever use of words. As for the popcorn/pop from the theater... don't remind me of the cost. My grandkids are here now for 3 weeks, and we most likely go the movies one day.... "Inside Out" is coming out the 19th.... the show and treats will cost a small fortune! I remember when we went to the movies on Saturday for .$.50 and saw TWO movies and a cartoon! We had money for candy from the $1.00 ! !! I love the play on words with this one! Where is that stamp set from? My son loves tea and he would love this! Where do I start...1) the cutest card ever! Love my tea, and I agree fresh brewed is best- definitely never microwave it with the bag in it. 2) Movie prices and food are outrageous- yes, I still carry a large tote with my water bottle in it and a candy bar! 3) So happy you made it through the renovation! 4) Did I mention...cutest card ever? Adorable! I love the doodle-style borders and the cute teacup. As for your dinners during renovation, I will not let my kids read this post as they would love to do this! Linda, thank you for the nice comment you left on my blog regarding the card I made for this weeks FMS challenge. As usual, your cards are always spectacular and inspiring!!! My mother still boils water for her tea. She insists it's much better than what the microwave can do! And although I love your card I can do without Lionel Richie singing in my head! Tea-lightful! I just love it! The soft colors are perfect with that sweet cup and tea bag…love those too! Boiling water is the ONLY way to go for tea! THis is adorable, and now I have that song in my head!!! I am with you on the microwave tea (ick) and don't even talk to me about the cost of the movies and "embellishments".....ridiculous! I sound like an old person, complaining about the good old days, LOL! Hope that kitchen reno is almost complete! Absolutely agree with boiling water for tea. The only concession is that I now use an electric tea kettle that shuts off. LOVE this card, Linda! SUPER cute card, Linda. I agree, tea without freshly drawn, boiling water is not tea at all! So glad your kitchen is almost complete! I haven't done that in 14 years. We BBQ'd everything while we waited, as it was summer. Can't wait to see the full reveal! So cute! Love the tea cup! Awesome card!!! I love the pretty tea cup and colors!! Soooo cute! Really made me smile today. I love this card Linda! I love a good cup of tea and totally agree that it can only be made in a kettle! I love this tea stamp set! Love the colouring! Glad your kettle is back and getting great use! So sweet! Love the soft colors and punny sentiment. Thanks for joining us at The Challenge! Linda you went straight for my punny bone on this one! Darling card! I love seeing it The Challenge gallery this week! Your meals sound delicious! LOL! Thank you so much for playing along, Linda. 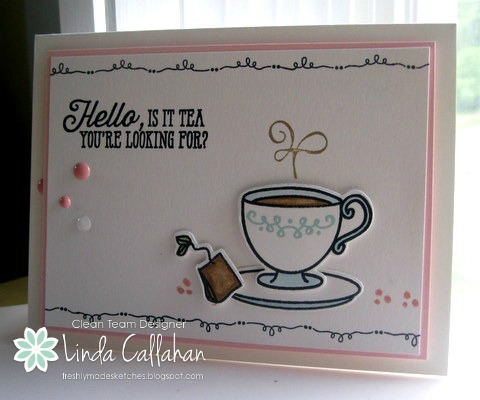 I love your sweet tea card! Hi Linda!!! So glad that you joined us, this is a lovely CAS Creation!!! 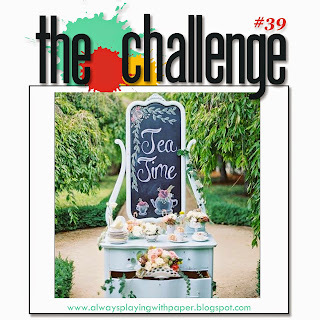 Thanks for joining us at the Challenge , and this week's BRAND NEW challenge is all about nautical, I hope you can join in as this is our last summer challenge!!!! !